Sixty-five music festival patrons have joined the lawsuit against organisers. Falls Festival organisers will face a class action for those involved in a stampede at the event in December. 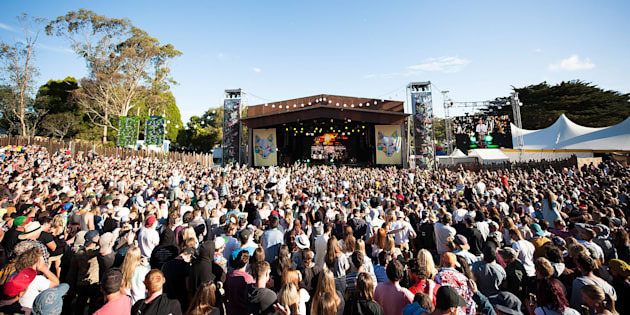 Sixty-five music festival patrons who sustained "serious injuries" as a result of a stampede at the Falls Festival in Lorne, Victoria in December have joined a class action lawsuit against organisers of the event for negligence. Appearing on ABC's Triple J: Hack program on Wednesday, Attorney Brendan Pendergast of Maddens Lawyers said the incident had a "significant impact" on the lives of those affected which resulted in "quite serious physical injuries and psychiatric and psychological injuries." "It was a very serious incident unfortunately and there are scores of people who have variously suffered quite serious injuries and those injuries and experiences had a significant impact on those scores of lives," he said. "Many of these people have suffered quite serious physical injuries and psychiatric and psychological injuries." At the time of the incident, Victoria Police said the stampede occurred when music fans at the front of a crowd were leaving a performance by DMAs about 9:50PM and was triggered when a number of patrons lost their footing. The crowd crush left up to 80 people injured with 19 individuals needing to be rushed to hospital. Medical treatment was provided on site to others with injuries, with paramedics treating at least 60 people on-site. Pendergast told the ABC the accusation of negligence against festival organisers comes with the claims of those affected that stage location and act scheduling could have been handled better and possibly made the incident avoidable. "The allegation is that if proper care and attention had been taken to configuring the area where the acts were taking place, and the scheduling of the successive acts this stampede would not have occurred, that this was entirely avoidable," he said. He also said those affected would be assessed for damages individually and the sum of losses could be "quite substantial", possibly amounting to more than $1 million, if Falls Festival organisers are deemed to have been negligent. "It wouldn't surprise me if damages of [more than $1 million] were ultimately payable, but as I say it's very early and we need to assess each of the claims on an individual basis." At the conclusion of the festival, event organisers released a statement on Facebook that said they were "devastated" by the incident and issued an apology to those involved in the crush. "With over 20 years of experience running festivals behind us, we are completely devastated by the crowd crush that occurred with patrons exiting The Grand Theatre, and we are beyond shattered that a number of our festival patrons were injured and impacted by this event," organisers said. "To those that were affected, on behalf of The Falls Festival, we would like to apologise and let you know that we are deeply upset by this incident and your experience." Triple J: Hack also confirmed on Wednesday the rules and regulations around the site design featured at the Lorne event currently remain the subject of a WorkSafe Victoria investigation. A spokesperson for the event said: "We are cooperating with WorkSafe in its investigation. We have had regular contact with affected patrons since the incident and are providing ongoing assistance. "However, given the matter is as of today the subject of legal proceedings, we are not in a position to comment further. We confirm that Falls will definitely be going ahead in 2017."